Boeing (NYSE: BA) and GOL Linhas Aéreas Inteligentes (NYSE: GOL and B3: GOLL4) today celebrated the unveiling of the carrier's newly outfitted 737 MAX 8 during a celebration in Sao Paulo. The leading Brazilian carrier also announced plans to fly the more fuel-efficient and longer-range 737 airplane on international routes. "Today is an exciting day for the entire GOL team, we are happy to welcome the 737 MAX 8. We can further improve our operational efficiency by flying a young, modern and safe fleet, while also lowering the cost of air travel and expanding our network to new international destinations," said Paulo Kakinoff, Chief Executive Officer of GOL. The first MAX airplanes arriving at GOL are the MAX 8 variant, which seats up to 186 passengers in GOL's configuration. The airplane will reduce GOL's fuel use and emissions by 15 percent compared to today's single-aisle airplanes, and can fly farther than its predecessor. 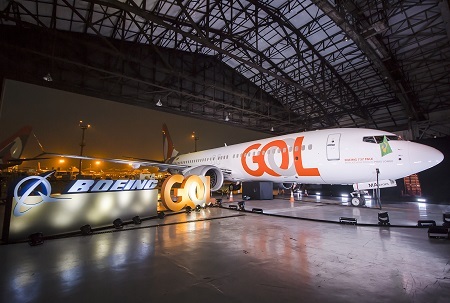 With the additional range, GOL said it will begin regular service from Brazil's capital Brasilia and Fortaleza to Miami and Orlando. GOL also plans new international routes to Quito, the capital of Ecuador, with the MAX. Thirty of GOL's new airplanes will be for the larger MAX 10, which will enable GOL to comfortably serve more than 30 additional passengers. GOL and more than 20 customers have placed over 500 orders and commitments for the MAX 10, which will offer operators the lowest cost per seat mile of any commercial aircraft in service. In all, the 737 MAX family has attracted more than 100 customers and nearly 4,700 orders. For more information and feature content, visit www.boeing.com/commercial/737max. "GOL is a pioneer in bringing affordable fares to Latin America since its inception. We are honored to have such a great partner officially join the Boeing 737 MAX family and serve as one of its ambassadors in the region," said Ricardo Cavero, vice president of Commercial Sales in Latin America for The Boeing Company. "We are confident the 737 MAX will help GOL continue bringing great fares and service to its customers, especially with the new 737 MAX 10 that will arrive in the future."